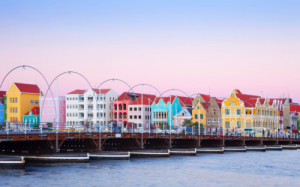 WILLEMSTAD - The first island in the Caribbean that can be explored with Google Street View. Yes, that is Curaçao. The campaign which was started by DJ Joris of the Dutch radio Dolfijn FM to get Curaçao on the map was a great success. This was celebrated yesterday at Fort Amsterdam in Willemstad. Prime Minister Eugene Rhuggenaath together with Minister Steven Martina and Minister Zita Jesus-Leito announced the news yesterday afternoon together with Joris Reer, who despite all the criticism and opposition continued his dream to get Curaçao, Aruba and Bonaire on the map. “I had to get in touch with Google's managers first, that was not easy, but it was possible to get a meeting via Skype. That was my chance to convince them that our little island has a lot to offer to the world and cannot be missed on Street View,” said the DJ yesterday during the event. Premier Rhuggenaath took place behind the wheel in the truck with the camera, waited until the other ministers and Joris had taken a seat and then drove from Fort Amsterdam to the city center to take the first pictures of Willemstad.